There are so many changes the body undergoes during pregnancy that it becomes easy to ignore the changes in the feet. During pregnancy the body releases hormones that allows the ligaments to relax in the birth canal. The ligaments in the feet also relax, causing the foot to lengthen and widen. Many will complain of a shoe size increase by one or two sizes. In most circumstances this flattening of the foot is benign and no problems result. But, in the diabetic this change in foot size is important to recognize. Despite the increase in foot size, many moms will continue to wear the same size shoes. As a diabetic, proper fitting shoes are of utmost importance. Increased pressure on the foot can cause areas of rub or irritation and potentially result in ulceration. Once there is an ulceration, one is at risk for infection, delayed healing and further diabetic foot complications. Diabetic neuropathy is the single greatest risk factor for developing foot ulcerations. Neuropathy is the loss of sensation in the feet commonly caused by diabetes. Many individuals will develop neuropathy before they are diagnosed with diabetes. Others will develop neuropathy years after being diagnosed with diabetes. 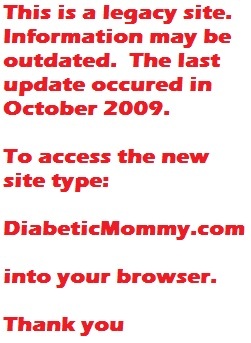 Luckily, gestational diabetes is not typically associated with neuropathy. Unfortunately, type I diabetics develop neuropathy much earlier than type II diabetics and may have neuropathy during their pregnancy. Regardless of the type of diabetes, it is still extremely important to have the feet evaluated to assess the status of the nerves. Even mild neuropathy increases the risk of ulceration. Wearing shoes that are too small causes an increase in friction and increases the risk of skin breakdown. walking around in slippers and lose, flexible shoes that are generally not supportive. Check your feet everyday: This is an absolute necessity if you are a type I diabetic or if you have diagnosed neuropathy. It is a good habit to practice regardless. Look for cuts, sores, bruises, openings or areas of irritation. Remember that if your nerves are not functioning properly, than you may not feel everything that is happening to your feet. If you cannot reach your feet, have a family member check your feet or place a mirror on the floor and put your foot over it. Check your shoes before you put your foot in them. Don't walk around barefoot: Wear a supportive shoe, one that has a rigid sole and bends only where the foot bends (at the toes). If a shoe seems too confined, find a slipper that has a sole that is semi-rigid on the bottom, or try a clog or slip in shoe with a more rigid sole. The remaining aspect of the shoe can be soft and flexible and allow for swelling, but the sole should be rigid from the heel to the ball of the foot. Buy shoes that fit your feet: Be aware of the changes your feet are going through. The feet are most likely widening and lengthening. Make sure the shoes don't cramp the toes. Your foot will not shrink after birth. Watch out for folds in your socks: A simple fold can cause rub or irritation on your foot. Swelling will be greater by the end of the day and the small crease that didn't bother you in the morning can rub an open sore or blisters on the toes. Serious consequences in diabetics can include ulceration and infection. Dry your feet and between toes after showers: Increased moisture between your toes can lead to skin break down and eventual ulceration. Don't be a victim of fashion: Most moms will avoid high fashion during pregnancy, but may try squeezing into that strappy heel after. Wearing high heeled shoes puts excess stress on the ball of the foot, cramps the toes and increases chances of ankle sprains. Test the bath water before stepping in: If you have neuropathy you will not recognize when the temperature is too hot. Check the water by inserting your hand into the water to wrist depth. Don't use a heating pad on your feet: Although the idea of heat on your feet may sound good after a long day, the heat will increase swelling and inflammation. Sore feet respond better to ice. Rolling your foot over a frozen sports water bottle will help ease the achiness in the arch. Wear a sock while doing this and don't put ice directly on your feet. The heating pad can cause burns in those who have neuropathy. Don't use any medication on the skin: Be careful of topical medications during pregnancy and during breast-feeding. Consult your doctor before use. Don't use medicated corn pads from the local drug stores if you have neuropathy. Visit your podiatrist: At the first sign of any problems, make an appointment with your podiatrist. Prevention is much easier than treatment. Christine Dobrowolski is a podiatrist and author of Those Aching Feet: Your Guide to Diagnosis and Treatment of Common Foot Problems. More detailed descriptions of diabetic foot problems and methods of prevention are mentioned in the book. She is member of the American Podiatric Medical Association and has written articles in the Journal of Foot and Ankle Surgery and The Lower Extremity Journal. She has co-authored a chapter in The Comprehensive Textbook of Foot Surgery in addition to writing Those Aching Feet. This is not a health care site. The editor is not a health care professional, is not qualified, and does not give medical or mental health advice. Please consult with qualified professionals in order to find the right regimen and treatment for you. Do not make changes without consulting your health care team. .
Because this site is for all diabetics at all stages of life, some information may not be appropriate for you - remember information may be different for type 1, type 2, type 1.5, and gestational diabetics. Articles submitted by other authors represent their own views, not necessarily the editor's. The editor and contributing writers cannot be held responsible in any shape or form for your physical or mental health or that of your child or children. They cannot be held responsible for how any of the information on this site or associated sites affects your life. The community associated with this site is a sort of self-help support group. Advice or information shared is personal and possibly not optimal for you. It is up to you to use this information as you see fit in conjunction with your medical care team. The results are your own responsibility. Other members or the editor or contributors cannot be held responsible.